Now that it’s been essentially a decade since sprinting came to the WC scene in a big way, we’re going to start to see skiers retiring who have specialized in sprinting to increasing degrees. Lind is a good example of this trend, as I have 74 WC level sprint races and only 6 WC level distance races from him. And four of those distance races came in the Tour de Ski. 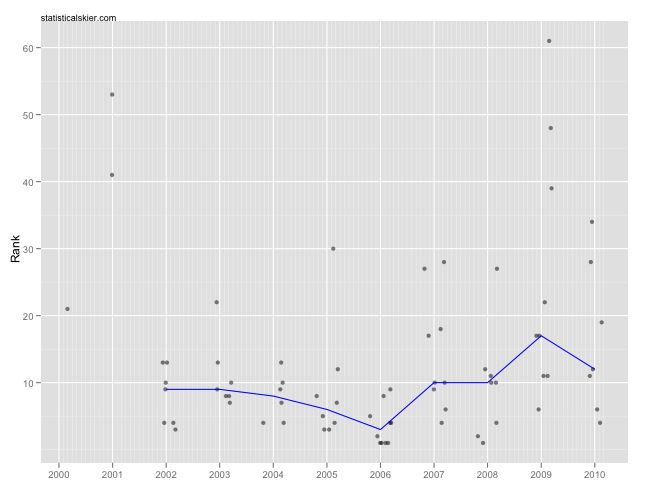 As you can see, 2006 was his strongest season, supplying fully half of the podiums of his entire career. Indeed, of his ten WC level sprint races that season, his worst was 9th, and all but two saw him reaching the top five. Post-2006, Lind suddenly became considerably less consistent, although he could still certainly pull together a strong race or two. 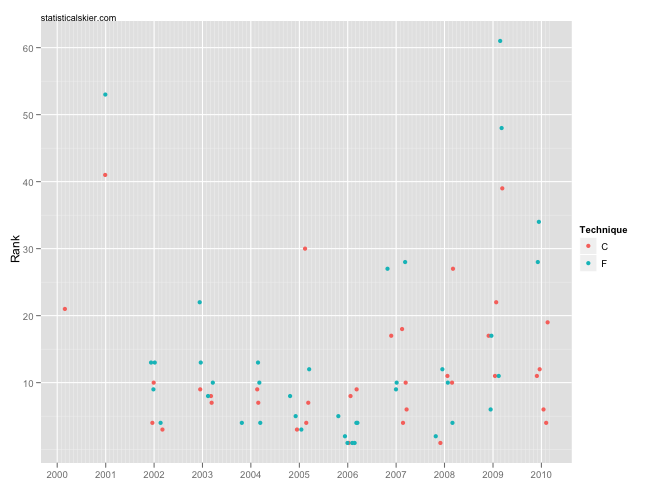 It looks like Lind had a bit of an imbalance in 2006 towards skating, but there’s actually a classic victory in there that’s hard to see because several dots are being plotted nearly on top of each other. Posted by Joran on Friday, June 10, 2011, at 6:00 am. Filed under Career Retrospective, Cross Country. Tagged björn lind, career retrospective, retirement. Follow any responses to this post with its comments RSS feed. You can post a comment or trackback from your blog.